Within this section, you will find all types of spare parts for Massey Ferguson tractors. 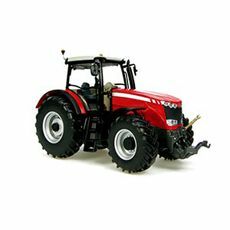 Finding them is very simple, as you can search by product and/or by Massey Ferguson tractor model. The products we show you have two references types: the Massey Ferguson OEM reference and the one for the part made by Repuestos Fuster (Fuster ref), which meets the same quality requirements and is at a more competitive price. These are non-original spare parts with full quality guarantees, as the strictest controls are followed in their production process, from the time of preparing the material, through finishing to the final labelling and packaging. You can be almost sure that we have the spare part in Repuestos Fuster that you need for any Massey Ferguson tractor model, as we have almost 600 different parts for over 25,000 commercial applications. We even have parts which are difficult to find in the market, due to their age, price or technical complexity. All of them are part of our vast stock, where we always have 99% of items available so we can send them to you for the following day; as we know that a Massey Ferguson tractor cannot stand idle for several days in the field or in the workshop. We are also concerned about the complementary nature of the parts we produce, so we not only manufacture the main spare parts, but also those parts required for proper assembly and operation, such as pins, nuts, seals and gaskets. Thus, with the help of Repuestos Fuster you can carry out the complete repair without having to go to several suppliers. How can I find the spare part I am looking for? It's very easy, as you can search for it in several different ways on the Internet. One very intuitive way is using the Massey Ferguson tractor spare parts menu, which we show you with all available products organised into ten part groups (Body and cab, 4WD front axle, 2WD front axle, Electrics, Hydraulic lift, Clutch, Linkage, Brakes, Engine and Transmission and power take-off). All the products influence the number of parts available, and clicking on its name takes you to another page where the corresponding Fuster and OEM references are given. Another way to find the part you want is by using Internet search engines. To find it, you enter the item, product, Massey Ferguson brand and/or model of tractor for which you are looking for the part.